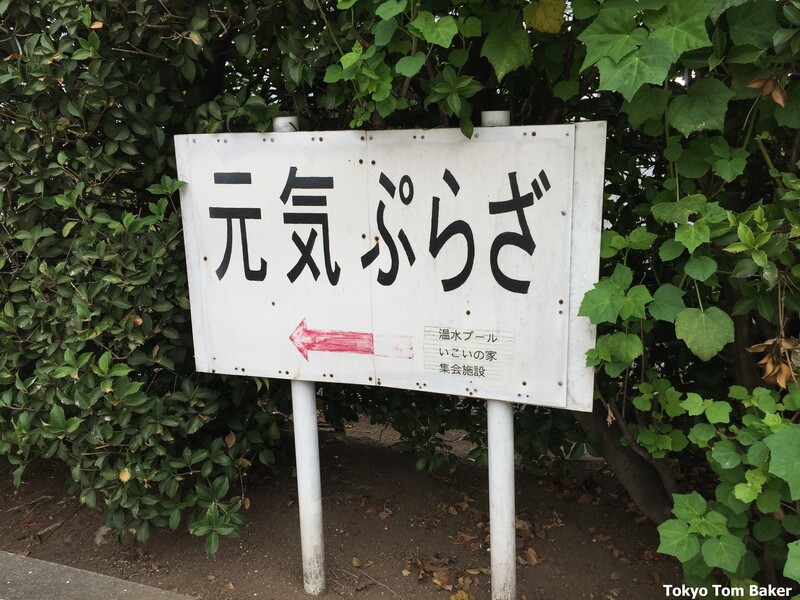 During the recent Obon holidays, the sports club where I usually swim shut down for an entire week. This gave me the impetus to get out and try some different pools. The first one I went to was Genki Plaza, a public facility near Shimo Station on the Namboku subway line in Kita Ward, Tokyo. Like many of Tokyo’s great public pools, it is adjacent to a garbage incinerator. I assume this is because the facility runs off the heat and/or electricity generated by burning trash, but I’ve never actually confirmed that. 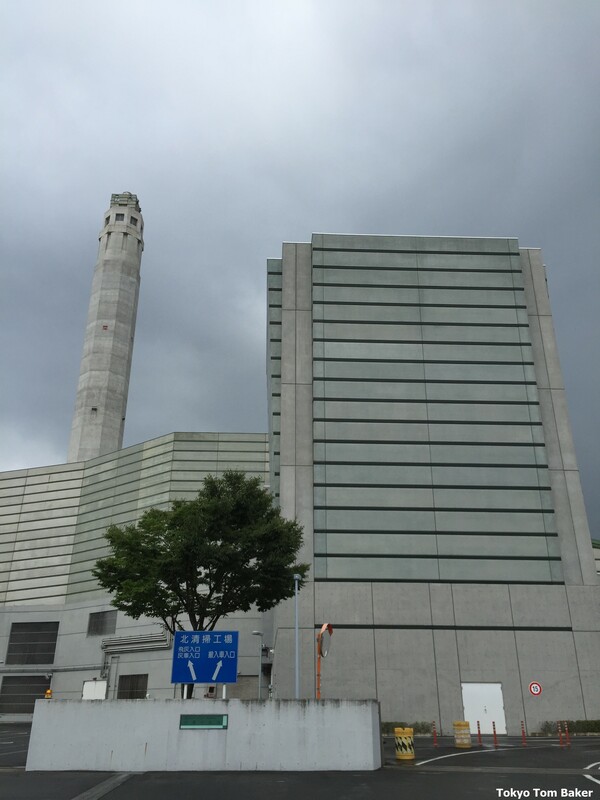 Nevertheless, just as a tall, thin, solitary smokestack in a residential area usually signals the presence of a sento (traditional public bath), so does a much taller, much thicker smokestack often signal the presence of a public swimming pool. Past this forbidding facade is a recreational pool with a 72-meter waterslide. The incinerator is just over a block south of the station. The entrance for garbage trucks faces the main road, but if you walk around to the back of the very large facility, you’ll find the entrance to the pool. The lobby has a vending-machine refreshment area with a big window looking down at the pools (plural) and up at the top of a gigantic water slide. As usual, there are signs all over the place forbidding photography, but you can see official photos of the interior here and here. Pay 400 yen for adult admission at a vending machine in the lobby, and you’ll get a plastic card that lets you go inside. The card also lets you use one of the lockers. The locker room floors have plastic pads all over them, but were very wet anyway. It’s one of those places you should wear sandals to, because you’ll never get out of the locker room with dry feet, meaning socks are a bad idea. There’s very little space to sit down. There is a spin drier, the only amenity to speak of. 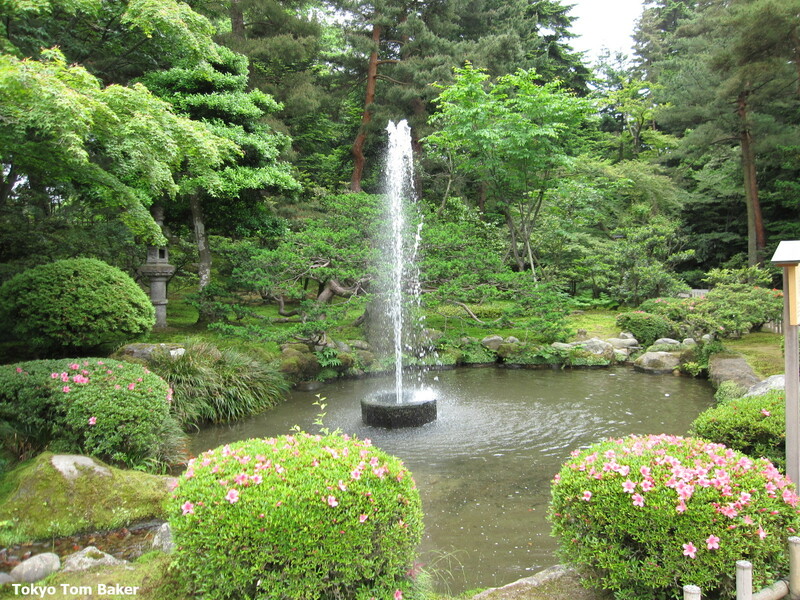 As for the pools themselves, the largest one is a circulating river pool in shape of an irregular oval – like an egg with a bite taken out of it. The river surrounds an island on which there is a 25-meter lap pool with just three lanes. On the day of my visit, one lane was for walking and two were for swimming. The swimming was one-way, so you had to duck under a rope at the end of each length. The depth was just 1.0 to 1.2 meters. It was very crowded when I arrived. A break had just ended, and the pool was full of adults and kids. Given the crowding and the shallow water, I decided to stick to breaststroke. I got 1100 meters in, and in that time the crowd significantly diminished. Most of the swimmers were well mannered and knew how to share a lane, but one foolish old man tried to do a one-length freestyle sprint and predictably ran over a child at the end. Oops. There was a Jacuzzi off in one corner of the facility and an kiddie pool with a tiny slide in another corner. But what I really wanted to try was the gigantic water slide that emptied into a small landing pool connected to the river. At first I hestitated to use it because there seemed to be no one on it but kids. But then I saw one little girl go up with her father, which made it clear that adults were allowed. It was quite high. The stairs took me high above the river pool, and then past the 2nd-floor window where a few parents were sitting around sipping vending machine drinks in the lobby. The slide, with twists and turns, is 72 meters long. After doing it once, laughing all the way down, I had to go back and do it again. Nobody that day made bigger waves in the landing pool. 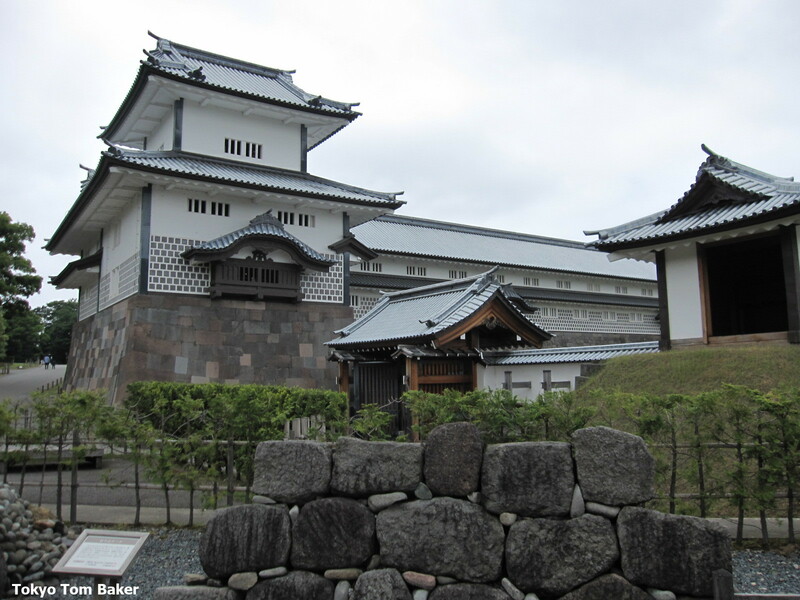 I spent last weekend in Morioka at the Japan Writers Conference. 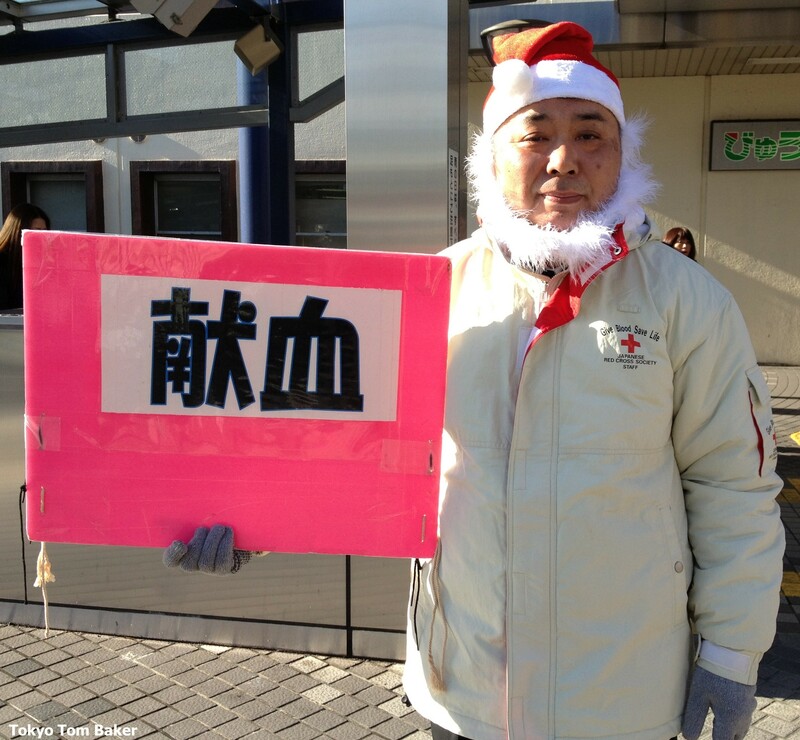 It’s a free, English-language event held in a different part of Japan every autumn. For the third year running, I interviewed a handful of the participants about what they write, what presentations they gave or attended, and what they would say to anyone who is thinking about coming next year. 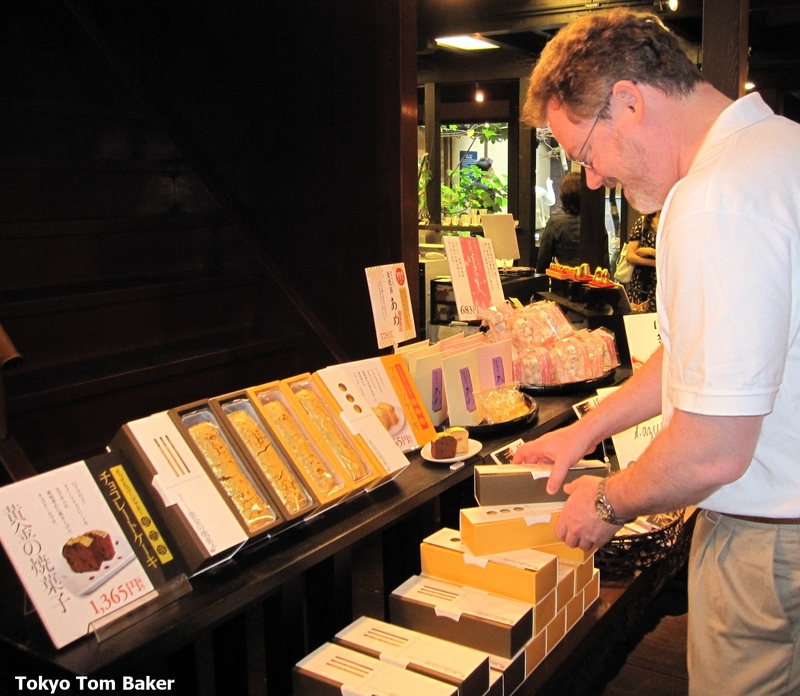 You can see the JWC video from Kyoto in 2012 here and the video from Okinawa in 2013 here. In Okinawa last year, I had lunch at an A&W root beer and hamburger shop. 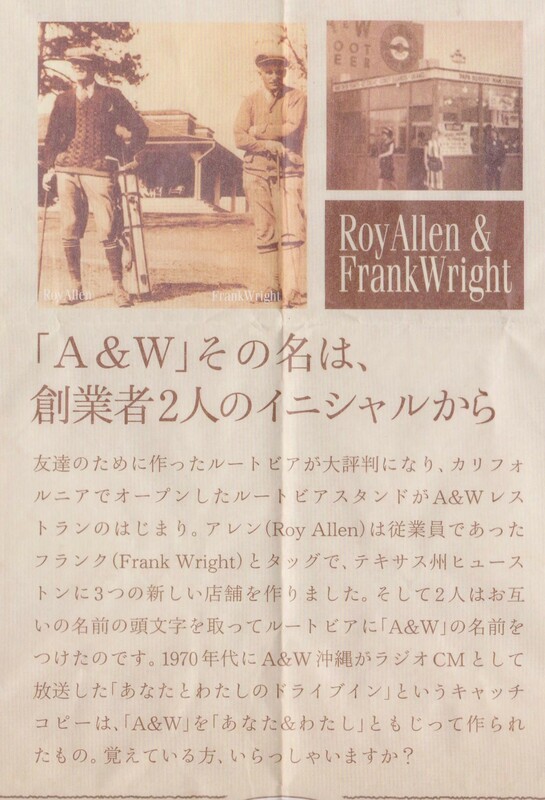 The placemat on my tray gave a brief history of the company, which has its origins in California and is named for founder Roy Allen and early co-owner Frank Wright. Okinawa got its first A&W in 1963, and in the 1970s the company ran a radio ad campaign with a little gag that could only work in Japanese. 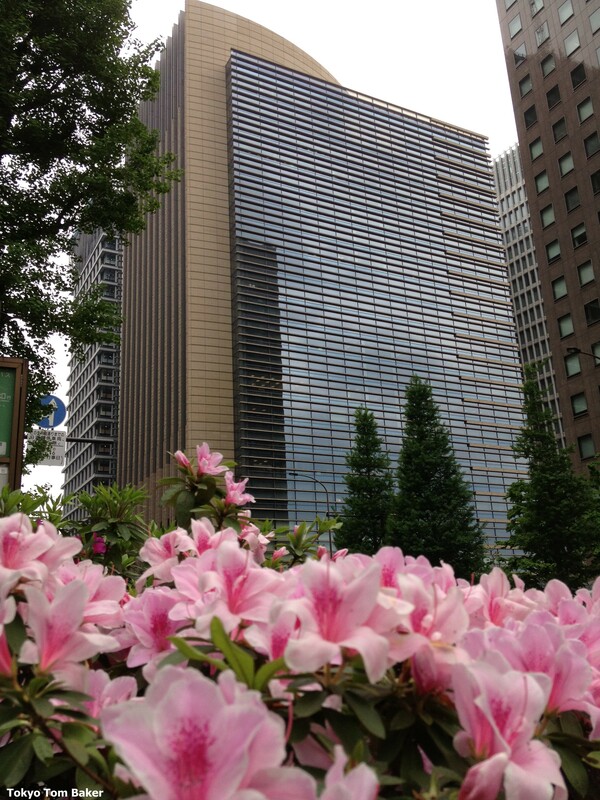 Azaleas are the most underappreciated flowers in Tokyo. For the past several weeks, they’ve been bursting out all over the city, but hardly anyone pays them any mind. 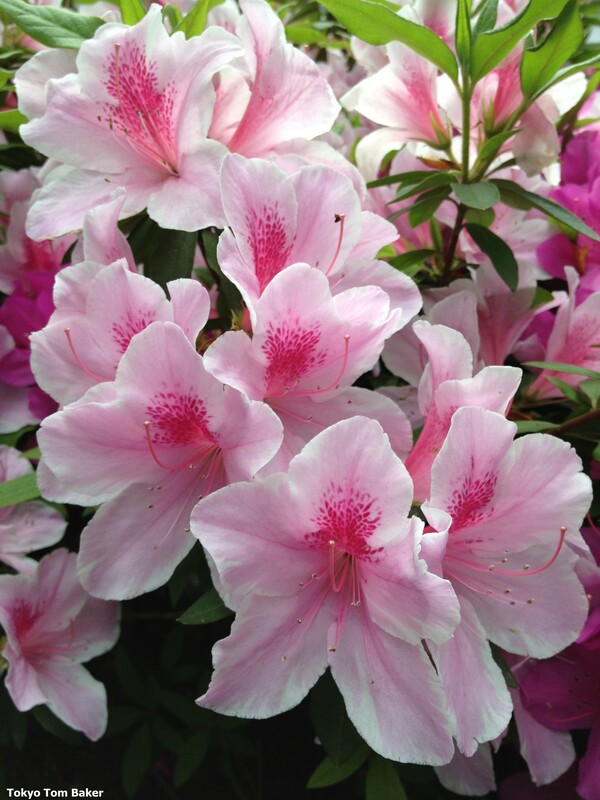 Azaleas have a tough act to follow, as they come into bloom not long after the cherry blossom season has ended. When the last of the sakura cherry petals have blown away, Tokyoites may think they are “done” with flowers for the year. 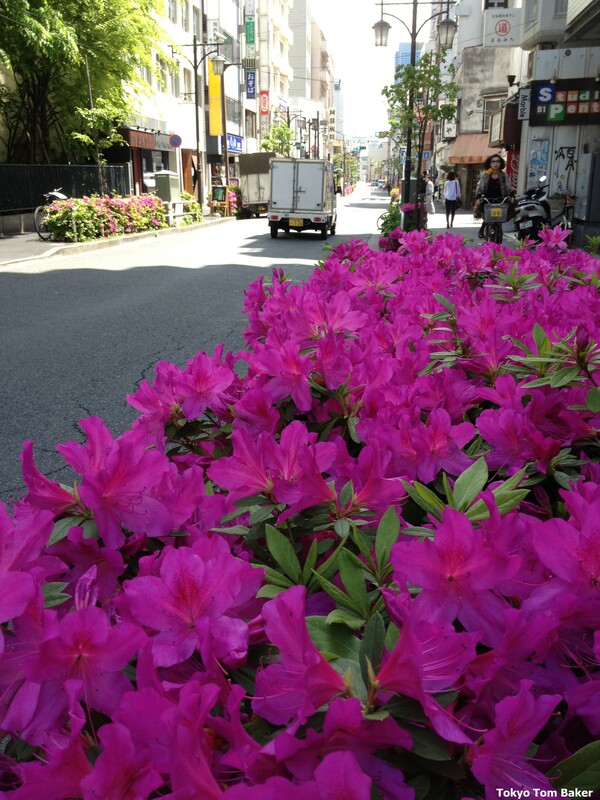 Maybe they fail to notice the azaleas all around them because the flowers literally keep a low profile, growing mostly below eye level. But for me, azaleas’ humility is part of their appeal. Cherry trees are aloof, appearing almost exclusively in parks or along riverbanks. 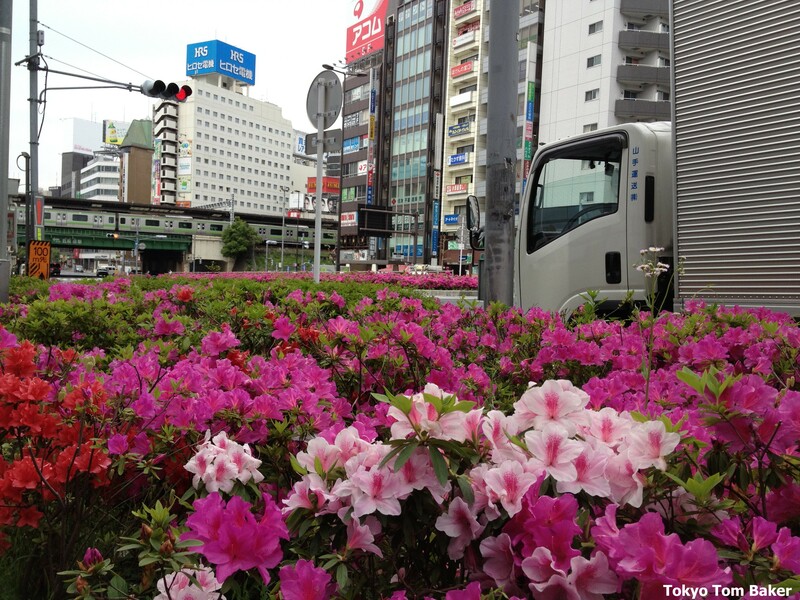 Azaleas are more active participants in the everyday life of the city, crowding alongside major traffic arteries, wandering down little side streets and even pressing up against busy rail lines. Cherry blossoms are prized for their delicacy and fleetingness. 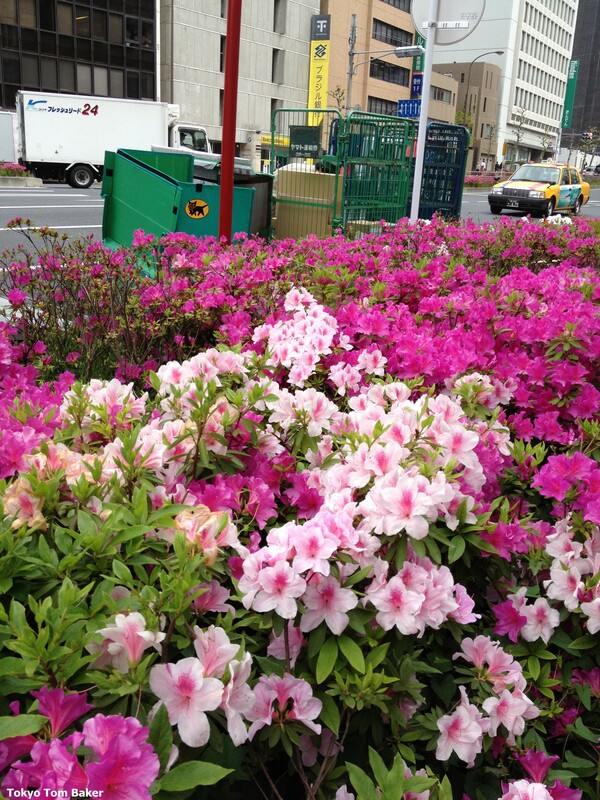 But azaleas should be admired for their durability. Twice in the past few weeks there have been heavy rain storms that I thought must spell the end for this year’s blossoms. 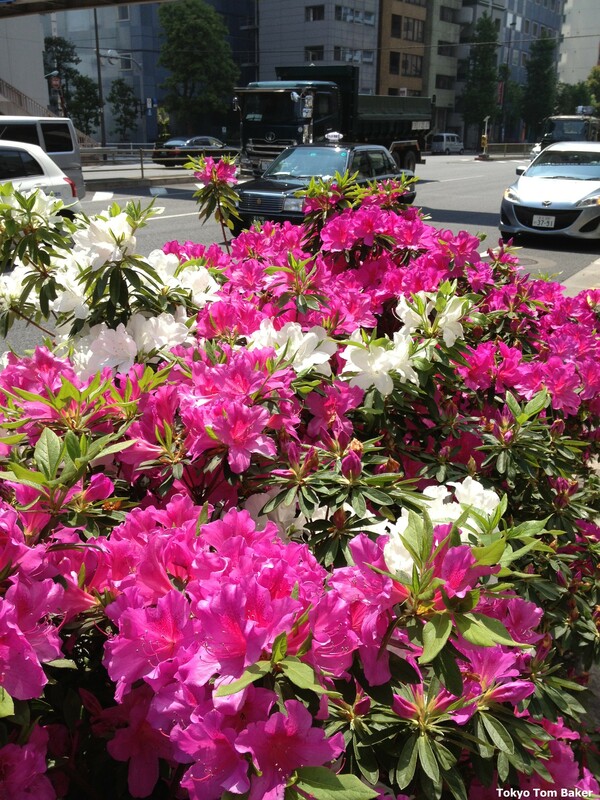 Although many have indeed wilted or been beaten to the ground, I keep stumbling across azalea bushes filled with flowers that look as fresh as ever. 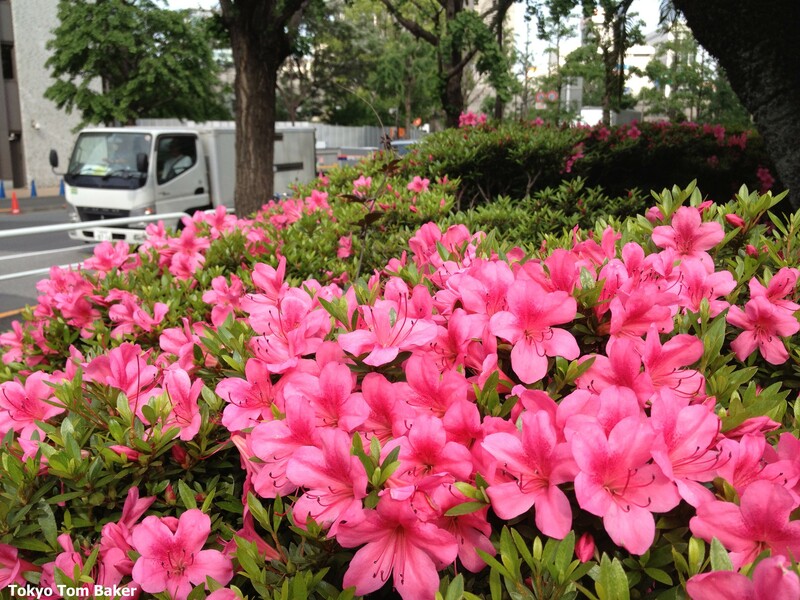 Azaleas show that one can be both beautiful and strong. But even the hardiest flowers don’t last forever. The photos in this blog post range from three days old to three weeks, and I think the end of this year’s azalea season may be nearly upon us at last. Cherry blossoms are iconic for Japan. 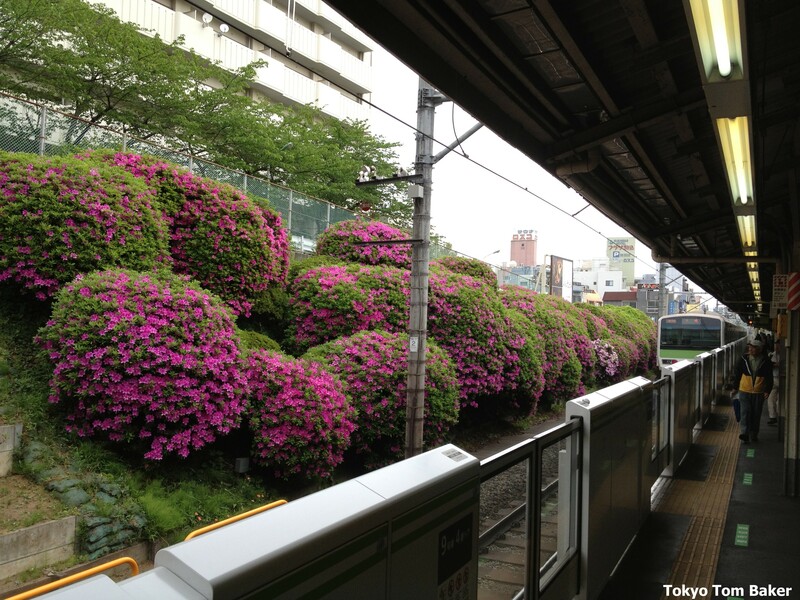 But for more of its time and over most of its space, Tokyo is really a city of azaleas. Don’t miss them next year. The Tokyo building where I worked for the last three years was also the workplace of hundreds of other people — plus a couple of guide dogs. … there was this eminently practical bit of canine infrastructure, discreetly tucked away in a corner of a third-floor utility balcony. 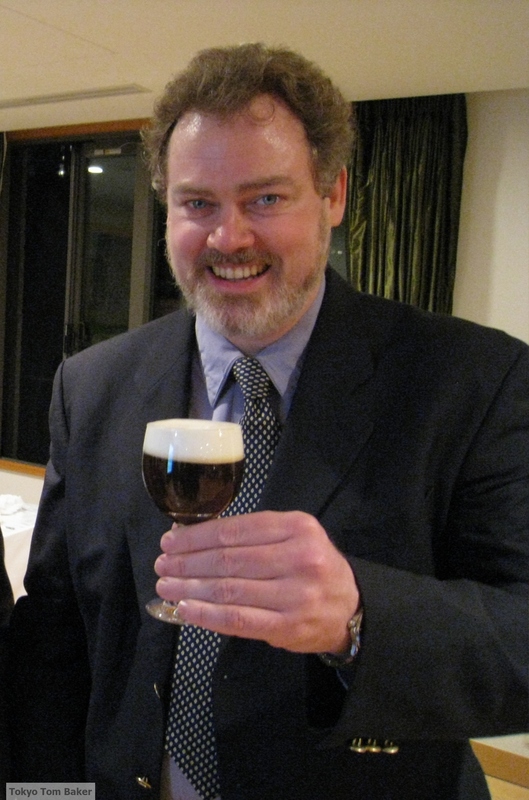 Back in 2009, I had the honor of being invited to a Christmas party hosted by a notable Irishman who was living in Tokyo. I had recently written an article about Irish coffee for the newspaper. When the topic came up, the notable Irishman very pleasantly opined that the concoction was a terrible waste of perfectly fine whiskey. Nonetheless, he immediately had his kitchen staff prepare a glass for me. 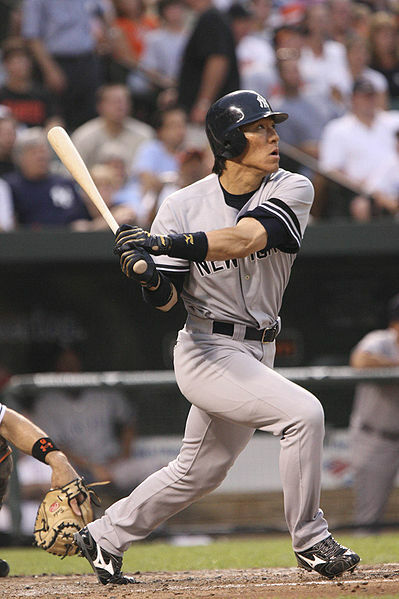 That’s how gracious a host he was. Here I am in 2009, a bit overdue for a haircut but right on time for a hot glass of Irish coffee. Irish coffee, by the way, is a cocktail consisting of strong hot coffee with sugar and whiskey, plus a layer of cream floating on top. It was apparently invented in the early 1940s to warm up transatlantic passengers landing at Shannon Airport. It was more of a treat for tourists than something the Irish drink regularly themselves. As I drank the delicious glass he had arranged for me, the notable Irishman regaled me with a story from another party he had thrown some years earlier while living in the United States. One his guests that evening was a famous American who, when offered a glass of Irish coffee, requested that it be made with decaffeinated coffee and nonfat cream. “Would you like it with alcohol-free whiskey, too?” the notable Irishman helpfully inquired. 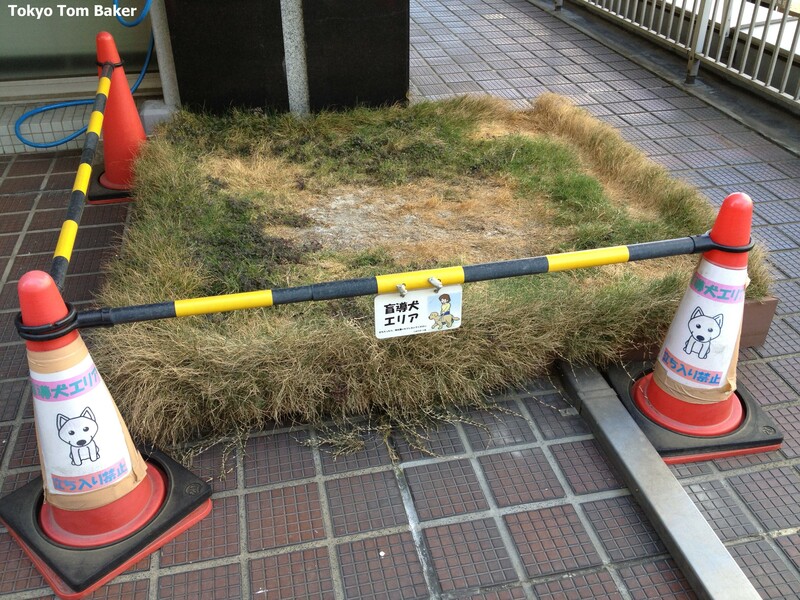 Well, time marches on, and now Japanese technology has made a commercial reality out of the Irishman’s absurd joke. There is now nonalcoholic Irish coffee … in a can. 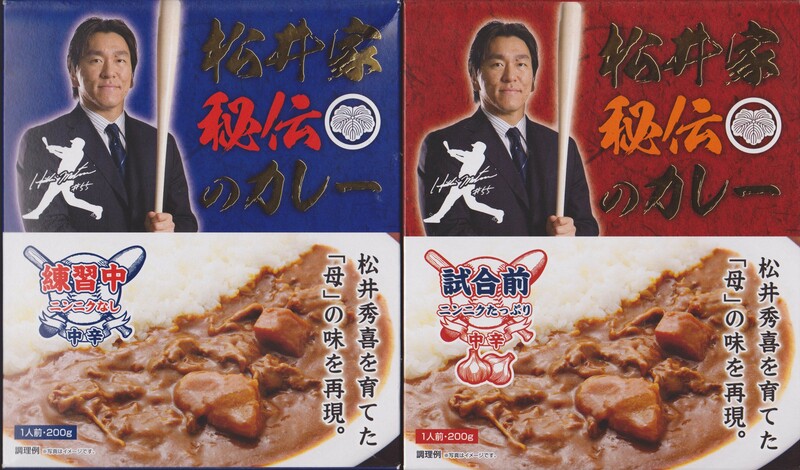 Japan has what is almost certainly the world’s most creative canned beverage industry. After enjoying such unlikely flavor triumphs as adzuki-bean Pepsi and canned pancake milkshakes, I was very much looking forward to their take on Irish coffee. Somehow, it does give off some alcohol-like fumes, but the flavor is more like hazelnut syrup than whiskey. The cream and sugar flavors nearly overwhelm the coffee flavor, so the final result is like drinking a liquefied hazelnut bonbon. 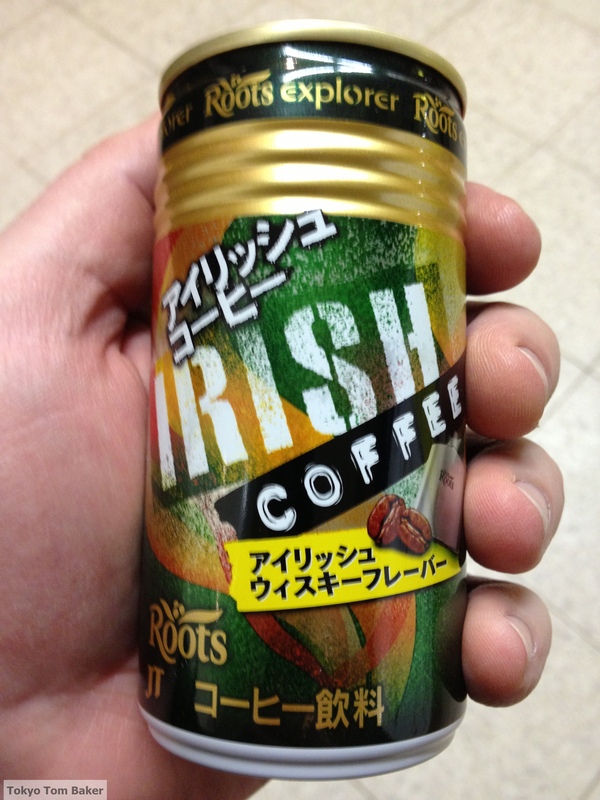 I respect the Japanese beverage industry’s spirit of experimentation, but if I were to drink a toast to that spirit, I’d rather use real Irish coffee. Is this a piece of accidental artwork? Is it a cleverly engineered illusion? 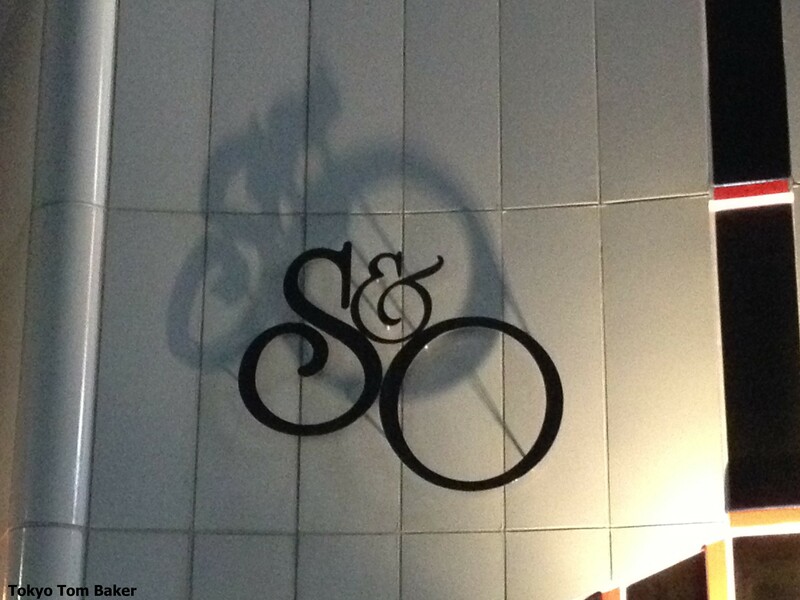 Or is there really a ghost on a bicycle riding across the front of a small building full of bars in Roppongi? 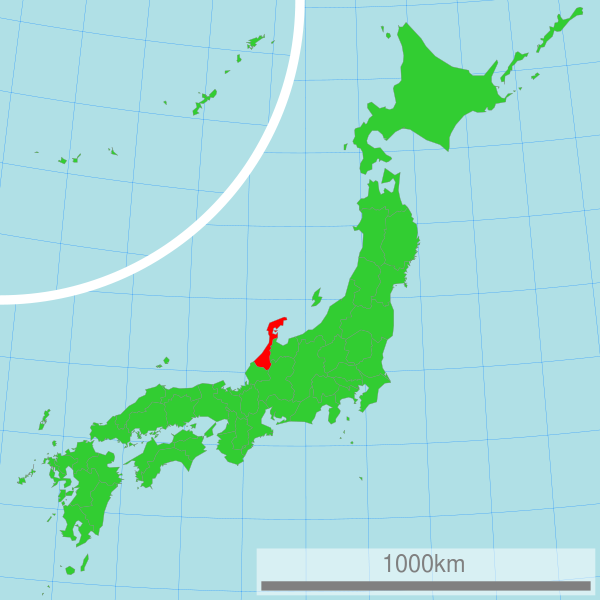 If you want to get in on the action, the next conference will be held in Iwate in the autumn of 2014.